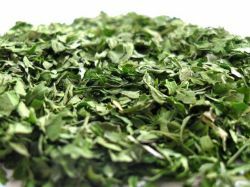 Flat Leaf Parsley( Petroselinium Sativum) and Triple Curl Parsley (Petroselinium Crispum) has been grown and dehydrated by Canterbury Dried Foods Ltd for over 18 years. In this time, an invaluable amount of expertise and knowledge has been accrued, which allows parsley of high quality to be harvested and its natural goodness and colour to be captured and sealed by our dehydration process. 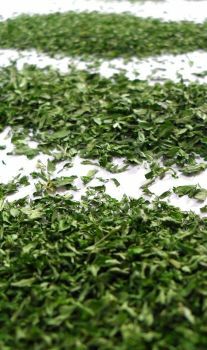 We oversee the growing and process all the parsley produced, so we have complete control over the production process. This means that we can ensure that the produce that reaches our production facility is of the utmost quality. 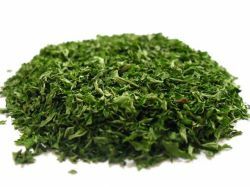 Parsley of both varieties is classified to various sizes and grades to meet the needs of our customers and is manufactured as flakes, granules and powders. Parsley has many vitamins and minerals and is rich in chlorophyll, beta carotene and essential oils. Though its bright green colour has seen it used widely as a garnish, it makes an excellent compliment to stews, soups and casseroles.